After a 30 year war between vampires and humans, the vampires now rule the world. Imagine living in a world where you are stuck inside a city, with little to no communication with other cities around you. The vampires keep you completely cut off from other parts of the world. The only thing that keeps you safe is supplying blood to the vampires to keep them from preying on humans. This is the world that Dawn lives in, the world that she must now delegate for. After the death of her parents, Dawn has been thrown into the role of delegate between the humans and vampires, with very little training at all. She had more responsibilities to deal with than any teenager should have. Luckily she has the help of her guardian, Rachel, who was appointed to take care of her after the death of her parents, and who also helped to prepare her for her role as delegate. She also has her best friend, Tegan and who considers herself to be a psychological expert on vampires, and a boyfriend, Michael, who is in training to be an elite guard to protect humans from the vampires. Things change for Dawn after she is saved by the very mysterious Victor. Victor is the son of the most powerful vampire in the surrounding area. He is definitely not what he seems. He was dark and mysterious, but also good in a way. He saves Dawn more than once from people that wish to do her harm. I have to say, I definitely enjoyed seeing Dawn with Victor more than I enjoyed her with Michael. I wasn’t sure how I was going to like this book, as it was another vampire novel, and they all seem to blend together after a while. But this book was very engrossing, and I was literally flying through the pages faster than I expected to. The world-building and storyline were so very creative, I was completely hooked. The ending will definitely leave you hanging, and dying to get your hands on the next book! Overall, I thought this was a great read. I was drawn in by the beautiful cover, but didn’t know how I would enjoy it being a vampire novel. In the end, I really enjoyed the book. I’m really looking forward to reading the next book in the series! I really want to read this, but the vampire aspects and the similarities in the blurb (to The Immortal Rules by Julie Kagawa) had me on the fence. Great review! I've been dying to read this! The cover is amazing, and I'm a sucker for dystopian ;) love the review! Oh! I'm so happy to hear that you liked it! I have it sitting on my shelf and I'm a little wary of it because it's a vampire book...but now I'm going to bump it up the list. My favorite part of this book was also the world building, though it doesn't look like I liked the book nearly as much as you did. I am hyped for the second book though. There's a lot of potential for it! Great review! I loved the synopsis from the moment I read it and since then, I have been immensely curious to read reviews. Sounds like this is a book I will definitely have to get my hands on! :-) Thanks for the heads-up! Great review! I've been immensely curious about this book since I first read the synopsis and am glad to hear that it lived up to the initial hype :-) I will definitely get a copy of this book for myself now. Thank you for sharing your thoughts! I see lots of people are on Team Victor! I'm glad you enjoyed this. Sounds like an exciting read ;) I haven't read a whole lot of vampire books so this should be interesting! Great review! Great review!! 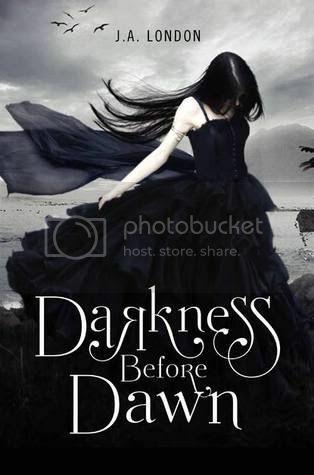 I was totally in love with the cover too and hearing that it was a vampire book made me jump for it right away! I can never get enough vampire books! I read so many and yet I can see all the vast differences in them and it's enough to keep me coming back for more! Cannot wait to read this one! Currently it sits in my TBR mountain...somewhere, as it's grown higher since I bought it! Glad you liked this one Christy .. I wasn't sure I was going to read this one because most of the reviews I had read were a bit negative but I'm definitely reconsidering : it sounds great !! I haven't heard too much about this one but I'm definitely thinking about picking this one up! I'm glad to know this one was addicting! :) Great review Christy! Engrossing? That's always good, especially when it comes to a vamp book. So hard to keep me interested when it comes to bloodsuckers lately. But I like the premise--I'll have to try this one out.